A «hot» summer season is closed, but a good time of new expeditions, discovery and fun just came with a long warm autumn. For the Trekking Club team October is a traditional period of developing: we are working on new routes and destinations, covering with furrow huge surfaces of the country. And the main idea of our rambles is not only to lay the groundwork for the next season, but to get an incredible feeling of friendship as well. 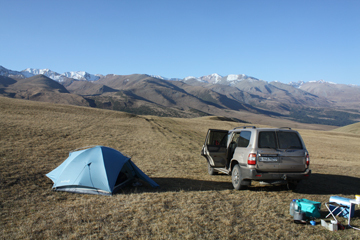 The aim of the expedition in early October 2013 was to discover ancient monuments of the upper reaches of Turgen river in Zailisky Alatau (North Tian Shan). Further to the information received from different sources (reports of the archaeological missions of KazPI Abai University, publications of A.Mariashev, historical maps etc.) we have chosen several areas marked as zones with a crowd of barrows and excavated settlements of Bronze age (4-1 millennium BC) and Early Iron age (Saki culture époque). Despite the fact that most of really interesting places are outside of the “touristic routes”, there are however some marks of previous visits and old trails remainders. But what we were really surprised of (! ): a huge complex of ancient burial mounts and sanctuaries we discovered at a highland pass that is not mentioned in any source and report! 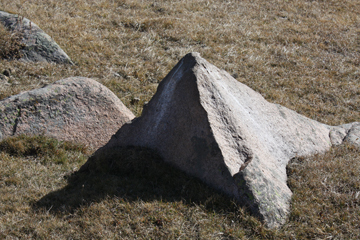 Giant barrows – pyramids made of earth and stones, with a hole on the top. Each mount is surrounded by a square ditch with an arm of about 15-20 meters. Burials are built in line, at a height of 3000m above sea level. On the other side we found several structures made of big stones formed in huge circles with 30 meters in diameter. And further – fallen rocky steles with 2 meters in height and about 70cm in width. We think that the burials and stone structures are the same complex. There are many of barrows of different periods can be found in upper reaches of Turgen and on Asy plateau. Burials presented at the picture are just round mounds of rocks distinguishable from any point of the plateau. Perhaps before they looked like hills but sink during thousands of past years. Almost all the barrows we found are accompanied by small mounds of stones, or separate triangle blocks, or ring-shaped structures – all them are detected as holy places or sanctuaries by the historians. Huge «kings» barrows are usually located on the tops of the hills, at highland plateaus or on the flat mountain slopes. In contrast to that, the settlements (“living areas”) of our ancestry were found in foothills, on the riverbanks – most often they lived at a flat sites of ancient moraines, close to the forest or pasture. During this expedition we explored the excavations of old settlement named Kyzylbulak-IV (further to the brook) that was used by the nomads for more that 1200 years, starting from the Bronze age. Bronze and Early Iron age settlements are presented as a number of dugouts, buried up to 2 meters, with stony masonry and wooden roof. Close to the living area there were ritual structures located (separate buildings with sacrificial altars huge domes and hearths). 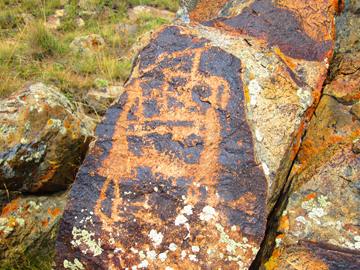 We were lucky to disclose a place with some new petroglyphs (rock-painting). A place is not mentioned on the maps and seems to be rare attended (only by local nomads). Here we found not only images of the goats that you can see anywhere in Zailisky Alatau, but a clever carved scenes with people and chariots, hunting episodes and ceremonies. It seems that a painted hill we found is a kind of gallery of 3 époques: Bronze (when it was appropriate to describe hunting, sacrifice, shamans and sanctuary scenes), Saki era (Early Iron age when an easily recognizable animal Skiff style displaced a cult of fertility and eroticism), and Turkic age (horsemen, flag-bearers and arrows). Outing is also enjoyable pastime, with great landscapes around. Bronze age (IV – I millennium BC): settlements of ancient tillers are placed in a foothill areas, by the riverbanks and on the flat ancient moraines. Most settlements consist of several dugouts sunken up to 2 meters. Economy is integrated: population of the rayon is cultivation small fields made on the river terraces, ranching cattle, hunting. Cemeteries are located close to the settlements to the west, on the riverbanks or near the brooks. Early Iron age (VII – III centuries BC): further to the local specialists reports, a climate in the region was different, a warm spell set in. 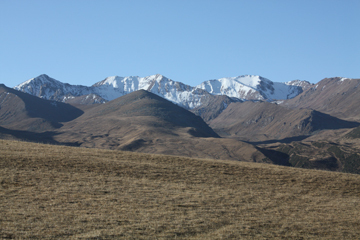 Possibly, moving of people to the foothills and further on in highland pasture (dzhailau) area is associated with a draught came to Tian Shan region. 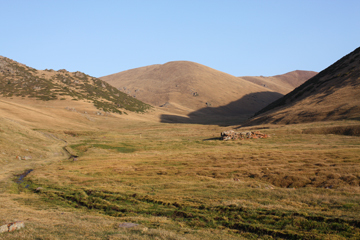 The mention period is also known as an age of early nomads: people with their bands came up to dzhailau (highland pasture) level where good grass and waters are available all the time, but further to the old tradition they continued to settle in an old-style huts made in ground holes. And only several centuries after men started to use dzhailau as a seasonal temporary setup. In the Iron period Saki (Skiff) tribes came to the region of Seven rivers (Semirechie). Saki also used proto-yurtas and shelters as houses. Their landfill sites are presented as huge burial mounts, sometimes with stony enclosure around the hill. “Kings” barrows (belonging to the tribal or warriors) are built on the highland plateaus and valleys, sometimes huge hills made of stones are also found on the mountain rivers banks. Early Middle ages (Turkic era): as a nomadic culture became predominate in Kazakhstan, then villages and towns are mostly settled in valleys of big rivers and along a Silk Way trails. 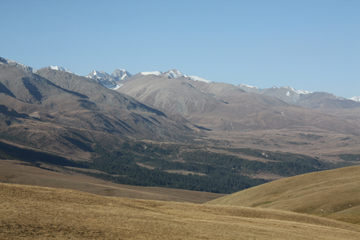 Mountain areas are mostly used for the seasonal cattle-breeding thus there are no any significant constructions of this age are found in Turgen and Asy. 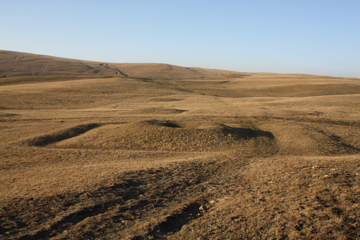 Nevertheless, there are number of Turkic cemeteries everywhere looking like small earth hills surrounded by funeral fence. Most of the barrows of this époque are built on the tops of the hills and by the slopes of small canyons (unlike Saki burials settled on the plateaus and by the highland wide valleys). Historical monuments of New Age in Turgen and Asy are presented with Kazakh ethnographical cemeteries dated of XVII – XIX centuries. They are usually set along the brooks and streams, on the flat sites close to the burials of earlier ages. 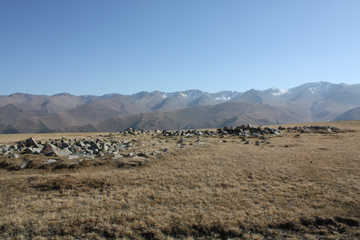 Kazakh ethnographical cemeteries are formed of a set of separate graves, with oval hills above them.